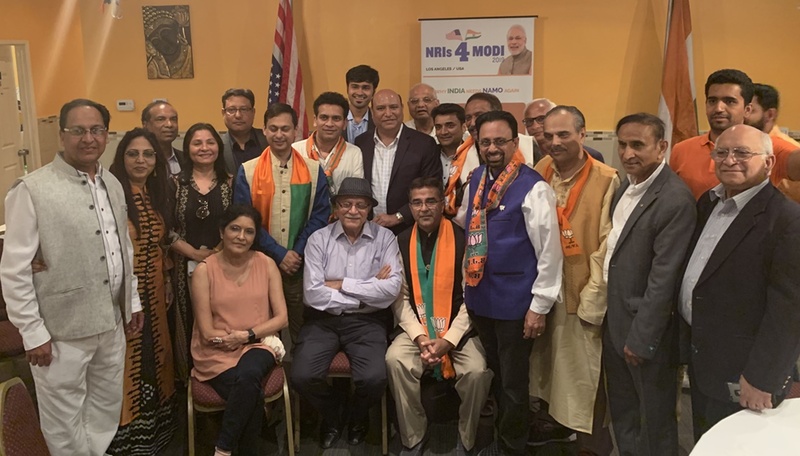 The Overseas Friends of BJP hosted “Chai Pe Charcha” in Los Angeles, Valley area on March 31st. Event was organized by P.K. Nayak, Sunil Agrawal, Manmohan Chopra, Kanaksinh Zala, Yagnesh Patel, Vijay Patil and Anil Mahajan. Event was attended by more than hundred people around the Los Angeles, Simi Valley and Orange County area. Emcee Sunil Agrawal welcomed all and said, “We will start our program traditional Indian way of auspicious beginning”, and invited guests to lit the lamps. Hosts and distinguished guest Rushubh Rupani, son of Gujarat CM Vijay Rupani lit the lamps. P.K. Nayak mentioned various ways to participate in the campaign for Modi. He emphasized that our ultimate aim is, we want Modi to win. Rushubh Rupani praised NRIs and said they are true representatives of India and represent Indian values oversees. He added that because of Modi’s foreign policy and India’s rising power, today, Indian passport become more powerful jumped up 20 point in ranking. Manmohan Chopra shared what amazing changes he witnessed during his trip to India on Pravasi Bharitya Diwas. He was full of praise of development currently taking place in India under Modi government. Dr Ranjan Gadasali mentioned that Modi’s strong and effective foreign policy changed image of India in the entire world. Iran, and Saudi Arabia both enemy to each other but working with India.Kanaksinh Zala, Yogi Patel, Pramesh Shah, Hema Chopra, and others also addressed the audience. Oversees Friends of Bhartiya Janata Party (OFBJP) co-convener Mr Ashvin Johar addressed the audience on the Google Hangout live from India. He shared some ideas how NRIs can help in election campaign. He suggested to send one minute video, which will be circulated in various social platform. He took Q&A session and answered lots of questions.In young audience, American born Deviki Zala also expressed view on Modi and was positive that Modi will be re-elected again. The Event was organized very well and planed meticulously. Everybody praised efforts put up by the hosts Sunil Agrawal, Manmohan Chopra, Kankasinh Zala, and Yagnesh Patel for putting up such a fabulous event “Chai Pe Charcha” in the Valley area. Organizing team thanked Paradise Biriyani Restaurant owner Sreeram and Swagatam restaurant for their support. This event was first in the series and next 7 such “Chai Pe charcha” events will be organized every week throughout Southern California.